I grew up in a small town (literally, our first stop light was installed in the mid 90's when I was in high school, and the second was installed in 2013) where everyone knew everyone, and most of my teachers also taught my parents. I knew I couldn't be a nurse like my mother. Sticking people with needles just wasn't my idea of a fun career. Something inside me just knew I was meant for Massage Therapy. After high school, I worked retail for a long time. But I never let go of my desire to return to school. I partnered with a classmate and we rented a small studio together. Working for yourself isn't easy. But we worked tirelessly to realize our dream. Soon another classmate joined us. Since then we have all grown our businesses and have gone our separate ways chasing the next chapter. I'm not sure what I would do if I couldn't do Massage Therapy. It has impacted my life in so many positive ways. 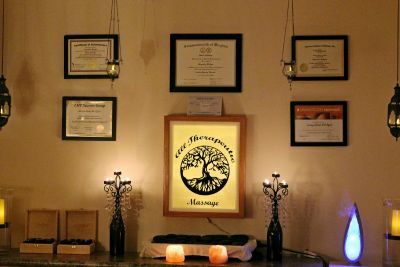 I have continued my education and have specialized certifications in Medical Massage, Infant Massage, Pregnancy Massage, Massage Doula, MediCupping™, Lymphatic Drainage, and AromaTouch Technique. I thank you for taking the time to read my bio and I look forward to meeting you very soon.